Russia’s lower house of parliament backs fines for alluring minors to rallies | Russian Legal Information Agency (RAPSI). MOSCOW, December 18 (RAPSI) – The lower house of Russian parliament, the State Duma, passed in the third and final reading on Tuesday a bill fixing fines for alluring children to participate in public events such as rallies, demonstrations, or pickets. The bill to prevent participation of minors in unauthorized public events in order to protect their lives, health and development was submitted to the State Duma in May. 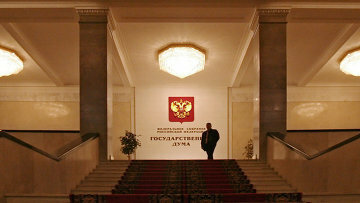 Amendments are proposed to the Russian Code on Administrative Offenses. The draft law stipulates fines of up to 50,000 rubles (about $800 at the current exchange rate), compulsory community service for up to 100 hours, or detention for up to 15 days for individuals. Officials and legal persons would face fines of up to 100,000 rubles (about $1,500) and up to 500,000 rubles (about $8,000) respectively.